John Negru (his Dharma name is Karma Yönten Gyatso) knows Canadian Buddhism. He is the founder of The Sumeru Press, an independent publisher of Buddhist books based in Ontario. 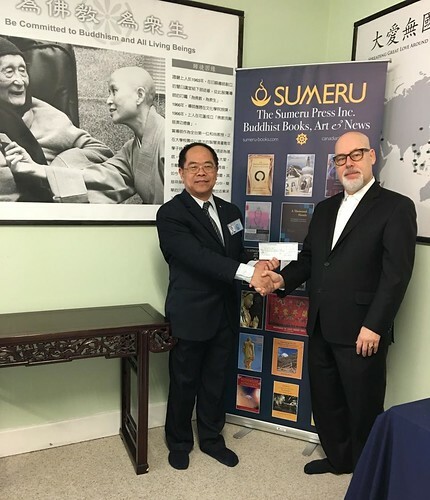 Alongside an impressive and growing catalogue of books produced by Sumeru, the company also hosts an online directory listing nearly 600 Dharma centers across Canada by location and/or tradition. Born in Montreal in the post-WWII baby boom, Negru followed the path of many North Americans who came of age in the late 1960s, reading books on Eastern spirituality and eventually dropping out of McGill University to pursue Zen practice at the Montreal Zen Center, where he lived full time as a monastic until 1975. While there he met and took refuge with the renowned teacher Kalu Rinpoche (1905–89) and later became a student of Geshe Khenrab Gajam (1928–93). Negru returned to school in 1975, this time at the University of Toronto. Dropping out once more the following year, he launched a graphic design—and eventually typesetting—business where he would work until 1990. Along the way he became the coordinator for the Toronto Buddhist Federation (TBF), which would later become the Buddhist Council of Canada (BCC). In the 1990s, the onset of desktop publishing caused the collapse of the typesetting business. Negru used this time to write on topics including typesetting, design, and publishing, as well as to teach at Ryerson University. He went on to earn teaching credentials and, after 15 years of teaching in Canadian high schools, Negru is on the verge of retiring, which he says will allow more time to focus on his love of Dharma publishing. Buddhistdoor Global: What motivated you to start Sumeru? John Negru: Originally, I wanted to combine my Buddhist practice and publishing expertise in 1993. I incorporated the company, but the technology wasn’t yet ripe. The idea then lay fallow until 2007. That year I met George Klima, who had a web directory of Buddhist temples. He wanted to upgrade it from basic HTML to a more fully-featured platform, and I offered to help. We put it on a Wordpress CMS platform and incorporated Google Maps APIs for each temple. Soon after, George wanted to retire, so I took our data and launched a new directory site: Sumeru, using my existing company to do so. BDG: So Sumeru in a sense began as an online hub, not as a publisher per se. JN: Yes, Sumeru began as a hub for Canadian Buddhist practice, news, and wayfinding, with an ecumenical focus. I published material honoring all traditions and lineages and eventually built a repository of material that exceeds 1,200 articles—a very valuable resource for Canadians interested in Buddhist practice, as well as for Buddhist scholars. BDG: How did the publishing part get started? JN: In 2009, I attended a publishing conference and learned about new digital production and supply chain management platforms that would allow me to realize my dream of publishing Buddhist books and distributing them globally, without the massive investment that typifies the giant legacy publishers. It was the convergence of the maturation of digital design tools, blog technology, digital printing, e-books, web-based supply chain management, and micro-payment systems in 2009 that was the fulcrum. Using that disruptive print-on-demand and e-book technology, I began publishing Canadian Buddhist books in 2009. Almost immediately, I was approached by Buddhist authors in other countries. While I publish books from all over, and sell globally, I’ve got a special spot in my heart for Canadian Buddhist writers! BDG: What draws authors to Sumeru instead of the other publishers? JN: Large publishing companies (regardless of their area of focus) are constrained by many forces that determine whom they publish, editorial calendars, economies of scale, warehousing and logistics, the shrinking role of print in our society, the disappearance of bookstore culture, and the enormous cost of marketing in a cacophony of competing attractions (just to name a few). As such, their publishing model is extremely risk-averse, and royalties to authors are typically in the 6–8 per cent range. A-list authors may receive significant advances, but books which are not guaranteed of significant sales don’t make the cut. As a Buddhist publisher, my model is completely different. I am not publishing to make a profit, although it is necessary for me to generate enough of one to sustain the business since it is not a charity. I see this as a collaborative venture with authors. We share costs (which are negligible with the new technology) and profits 50/50. In many cases, we donate the profits—or a portion thereof—to a Buddhist charity. I am more interested in fostering new voices and bringing a Buddhist perspective to new societal contexts. Many of the authors who have published with me have published with large publishers before. They found the demands of those companies for editorial changes to fit into that publisher’s “vision” unacceptable, and/or they were told their book would be published in 3–4 years because of the existing editorial schedule. Just as with any large publisher, large Buddhist publishers are constrained by the realities of the marketplace and tend to cater to the largest possible demographic. Many Buddhist publishers are conduits for the teachings of their unique lineages and are not independent of them. They may be very well funded and have a built-in audience, thus insulated from the rough-and-tumble of the market, but they are conversely limited by those parameters. University publishers are also very narrow in focus. Sadly, I have had conversations with many Buddhist scholars about great book ideas, only to be told they must publish with university publishers to advance their careers, since university tenure committees look down their noses at “popular” publishers. As with many other aspects of life on this planet, diversity is healthier than monoculture. Publishing should not be a zero-sum game. BDG: How do you see the state of Buddhist publishing today? Is it growing, stagnant, or under threat? I see two very large behemoths (Shambhala and Wisdom), a smattering of guru-centric publishers focusing on one lineage, attempts by large secular publishers with “spiritual” imprints to capitalize on interest in Buddhism from the general public, and me. I don’t see a vibrant small-press culture and that is distressing. There is an unsettling emphasis on shallow, feel-good books for those just contemplating or entering the Dharma path, at the expense of more challenging titles. That includes the current trendy topic of mindfulness, which is (in my humble opinion) mostly a secular subversion of Buddhism divorced from its larger ethical or transcendental contexts (with a few exceptions). Good as far as it goes, but it doesn’t go very far. On the flip side, I’m starting to see a maturing and broader scope in Buddhist writing that was absent before. Buddhist teachers, practitioners, writers, and scholars are trying to apply Buddhist perspectives to societal issues (social justice, political issues, environmental activism, gender and sexuality, interfaith dialogue, etc.) For example, the book I’m in the middle of writing now is about the intersection of engaged Buddhism, emerging technologies, and sustainable development. Yet thanks to the committed work of Buddhists such as Negru across Canada, the US, and beyond, the light of the Dharma continues to spread and thrive across continental North America.